The following is an article that I wrote but never published on judging special awards at dance competition. The excitement of getting ready to judge at Sophisticated’s Nationals back in July of 2014 inspired me to share my thoughts. I absolutely love what I do–can you tell? Please feel free to share your thoughts! 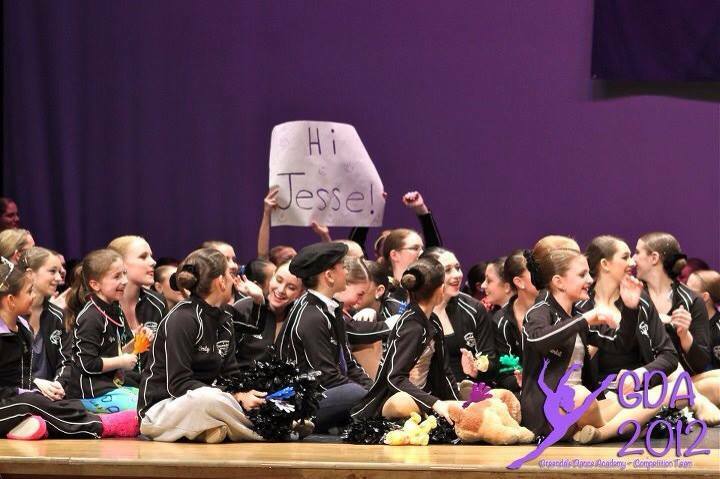 Dancers made a sign for me in Manchester, New Hampshire! It occurred to me to share my thoughts as I get increasingly excited about traveling to Wildwood, NJ next week to judge Sophisticated Productions’ National Dance Competition. The reason why I am so thrilled and can hardly contain my excitement is that this will be my first time judging special awards at the Nationals, although I have judged specials at dozens of competitions before. 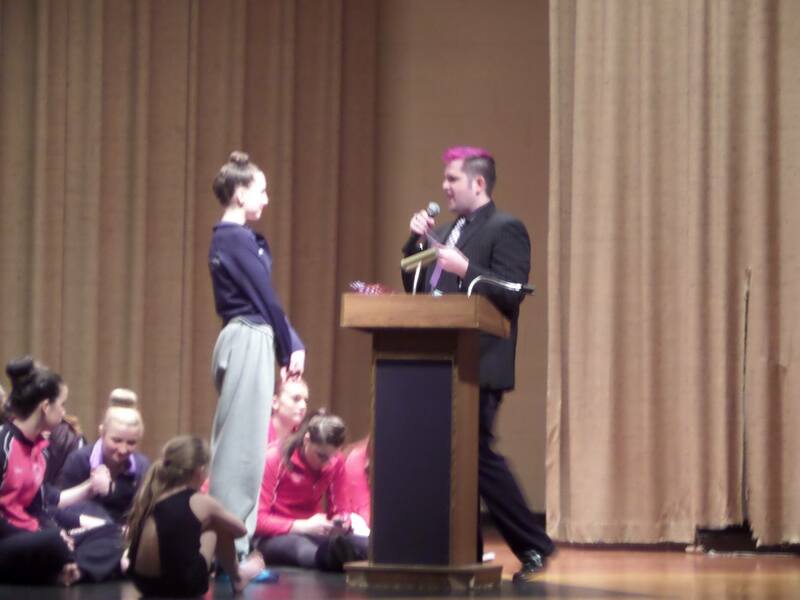 I have often joked–but still with a lot of seriousness–that my purpose in life is to do special awards at dance competitions. It is, in all honestly, those moments doing my awards that I feel I am fulfilling my highest potential as a human being and I’d love to tell you why. I have found specials to hold the potential to transform lives and I wanted to take a moment to tell you about their impact on me and about their potential impact on the world of competitive dance. While many lament the rise of competitive dance and associate it with increased pressure, hostility, and drama–both in real life and on TV, of course, I believe that Special Awards (especially if done the way I do them) offer a unique and powerful antidote to the negativity that can sometimes prevail in the competitive dance world. I view my job as being charged with the very serious and important task of observing, acknowledging, and encouraging the special personal achievements of the dancers I have the opportunity to judge. There is no science to what I do. No formula or quantitative standard dictates what awards I will give or to whom. My awards don’t favor the highest scoring competitors, nor do they favor the lowest, although dancers from both of those categories do receive awards. Rather, I seek to reward what, in my judgment, might be the most special quality or potentiality offered by a particular dancer. Or I might notice what a particular dancer or choreographer might be the most proud of–perhaps their biggest achievement of that dance year. Giving them that acknowledgment and articulating to them on stage what made that piece so powerful to me and everyone else watching is not only a great delight for me, but oftentimes I hear that such a moment was just the kind of encouragement or validation that a certain dancer, teacher, or choreographer needed during whatever challenges they may be facing. This is what I like to think of as the transformative potential of the special award. There are many lighthearted moments as well. What became my signature trademark this season was my vividly colored hair. 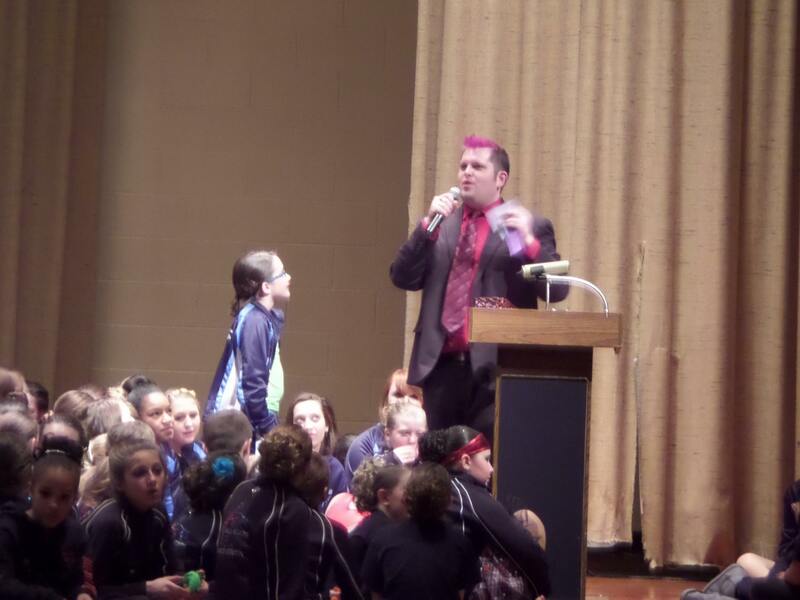 In Springfield, Massachusetts my hair was dyed pink and on the second day of competition, an 11 year-old-boy came onstage for his solo with his hair temporarily colored pink in an obvious reference to my own. The audience went nuts and my recognizing him up on stage made his day and was surely remembered both by his family and the entire audience. I also recall once judging in Houston, Texas. A man in cowboy boots stopped me in the hallway after the competition had ended. I will always hear his calm Texan drawl in my memory as I reflect on what he said: “I used to think that a man that didn’t work in the oil industry didn’t have a really important job. But you made my granddaughter feel like a million bucks today. You, sir, are excellent at what you do.” I was moved beyond belief because I knew that this was probably the biggest compliment he could give someone and I was so glad that he took the time to stop and give it to me. This year, in Bristol, CT a studio from Sandy Hook, CT gave me perhaps the most humbling gift of all. They gave me a small rubber ducky with the colors of Sandy Hook Elementary School and told me how, in the wake of the terrible tragedy that happened in December 2012, students who went to school there will bestow one of the ducks to a special person who made a positive difference in their lives. They told me to take the duck with me on my travels and that I would always be safe. I have taken the duck to every competition with me, where it sits on the judging table and watches the dances with me. I will be taking my Sandy Hook duck to Nationals with me and sending a picture back to the kids in Connecticut. In another instance, in Springfield this April, I called a girl up on stage and she came up so excited that she was practically jumping up and down. I don’t recall what score she received–it didn’t even matter to me. But her passion for performing and her effervescent personality made me think this kid was absolute dynamite. I said to her, “Wow! You seem so I excited! I love that!” Her response I will remember forever–”I’ve been coming to this competition for four years and this year I said I don’t care what kind of trophy I get at all, I’m just going to try really hard to get a special award from Jesse and now I got one! !” I was so touched, I couldn’t help but simply beam and hold back tears of my own and we gave her mom a chance to take a picture of us together onstage. I was so touched that I had factored into her competition hopes, but more importantly, her reaction crystallized for me one very important realization: special awards and that unique chance to give a dancer acknowledgment and validation invariably make a bigger, deeper, and more memorable impact on a young person than any silver/gold/platinum/titanium trophy or place in a top ten list ever could. I believe that special awards offer a unique possibility within the competition world: they remind us all of what dance really is–an artform that is meant to allow us to communicate deep, complex, and beautiful feelings with our audiences, affirming that we are all indeed more similar than different as human beings. And furthermore, the power of special awards also reminds everyone of what our purpose at competition should be: to educate, to strengthen, and to inspire the talents of young people. The skills they learn here and the esteem and self-love that I hope is developed within them will carry them far, regardless of what their dreams might be. I must admit that I really sought to “hit it out of the park” this year with regard to doing my special awards. Shortly before the competition travel season started, I watched an interview with Maya Angelou in which she offered a piece of her legendary wisdom that I have carried with me since. She said “When I step up on the stage, I bring everyone who has ever been kind to me with me.” I decided to always take a moment before I am announced to do my awards to think of people who have been kind to me and who would want me to do this job well. I thought of my dance teacher, my own parents, my dancers back at home, the competition owner Melissa Tessier who thought I would be good at this, my late grandmother, all my loving dance teacher friends, even the nice lady at the hotel breakfast that morning. Everyone who ever wished me well, I imagined them coming up there with me and I was able to relax, be so totally myself, to feel so loved, and to share that power and that sheer joy with all those kids sitting up on that stage. This year I shared that Maya Angelou quote in every city that I traveled to and dared the kids to do the same thing before they performed. I wanted them to imagine all the people who had ever been kind to them and to do what Maya Angelou suggested: offer an invitation to those kind people, “Come with me….I’m going on the stage. Come with me; I need you now.” Don’t think about dancing “against” anyone–imagine the people you are dancing FOR. A few dancers took the time to come up to me and say that this thinking allowed them to give the best performance of their lives. I absolutely beamed. . . and I knew exactly what they meant. Next week at Nationals, I will be using that advice and sharing it every time I step up on that stage. My hope is that at the final awards banquet at the end of the week, when I take the podium for the last time, everyone in the banquet hall will be able to recite that line along with me and take its wisdom with them wherever they go from there. Thank you for your time in listening to me and allowing me to share with you a little bit about how special awards, especially those done with depth, enthusiasm, and sincerity can change and shape lives. I have had the opportunity to keep in touch with many of the dancers and choreographers to whom I have given awards and have many more stories about the impact that such awards can have.